Cryosurgery is the best method of elimination of varicose veins, which meets patients’ and doctors’ expectations. It allows to get rid of the disease with minimal damage and results in removal of perforators without leaving scars (miniflebectomy technique). It is also unnecessary to stay at hospital and undergo anesthesia. This technique is based on insertion of the probe through a very small skin incision. Tip of the probe decreases temperature to -80ºC, resulting in cryoapplication effect, i.e. sticking of the surrounding tissues to the probe. Cryostripping bases on Babcock’s method, which is extirpation of varicose veins by freezing. In order to remove a varicose vein, cryoprobe is introduced into the lumen of a vessel, or applied externally on the vessel wall. Cryostripping allows removal of varices after previous sclerotherapy, i.e. injection of obliterating substances. A low temperature exerts an analgestic effect with simultaneous occlusion of small vessels, resulting in prevention of intraoperative bleeding. A design of the probe allows the surgeon to obtain an approach to all varicose veins without the necessity of additional incisions of the skin. This method became an ideal measure in treatment of varicose veins, complications of varicose disease. 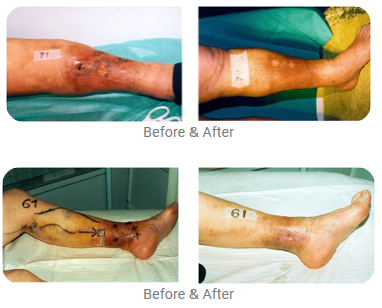 In these cases, this technique is absolutely competitive for classic, vary drastic Linton operation (skin incision from the knee until the ankle), or a novel – but very expensive method of endoscopic ligation of perforators. 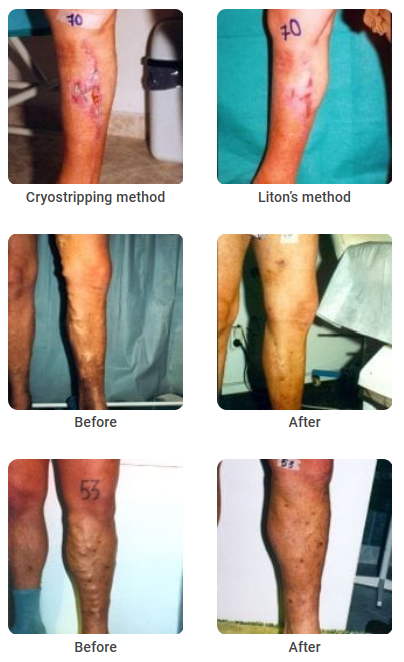 – Cryostripping in venous ulceration treatment is a low invasive, precise and inexpensive, method. Fundamental part of this method is removing, partially randomly, anastomosing veins in the region of ulceration, leading cryosurgical probe in suprafascial layer. To do that, after removing varices operator enter the cryo probe to the position possibly nearest to the ulceration, but in the region of healthy skin. Operator definitely must avoid an incision in the region of lipodermatosclerosis. At first using cryostripping method, operator remove perforators, previously marked during Doppler test and palpation. Then try to separate the whole region of ulceration from the fascia together with few centimeters of skin margin. Sometimes this procedure needs an additional incision and entering the cryoprobe from the different place.